Senate leaders agreed to a massive two-year budget deal on Wednesday. Some House Democrats don’t like it because it does not include a solution for the Deferred Action for Childhood Arrivals (DACA) immigration program. Some House Republicans don’t like it because of its large increase in federal spending and its potential effects on the deficit and debt. Senate leaders announced an agreement on a massive two-year bipartisan budget deal on Wednesday, but the agreement came under almost immediate fire from nearly every corner of both political parties. Both House Republicans and Democrats bristled at the deal – for vastly different reasons – as Congress works to avert a second government shutdown in less than a month by a Friday deadline. On the House Democratic side, members were displeased with the lack of progress on a deal to codify the Deferred Action for Childhood Arrivals immigration program. The Obama-era initiative protects from deportation nearly 700,000 unauthorised immigrants who were brought to the US as minors. Trump announced he would end the program in September but gave Congress six months to pass a law to extend it. The government shutdown last month came largely as a result of Senate Democrats’ refusal to vote for a funding bill that did not contain a DACA solution. In ending the shutdown, Senate Majority Leader Mitch McConnell agreed to hold an open-floor debate on a DACA solution in the Senate, but there was no such commitment in the House. On Wednesday, House Minority Leader Nancy Pelosi said the conference would not support the Senate budget deal until House Speaker Paul Ryan made a similar promise. Pelosi filibustered House business for over eight hours with a marathon floor speech demanding a vote on DACA. Meanwhile, conservative House Republicans blasted the plan’s calls for a nearly $US300 billion increase in federal spending over the next two years, raising concerns over federal deficits. A source close to the House Freedom Caucus, a hardline conservative group of roughly 30 members, said the group was not supportive of the deal. As part of the deal, areas hit by natural disasters in 2017 – like Texas and Florida – would receive additional relief funding. Rep. Mo Brooks, a Freedom Caucus member, told reporters he is a “hell no” on the Senate deal. 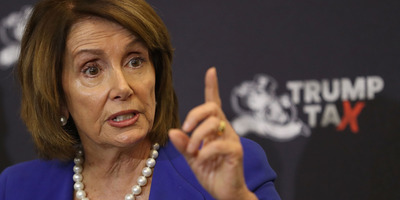 Rep. Mark Walker, the chair of the powerful, 154-member Republican Study Committee, also expressed distaste with the plan – while taking a dig at Pelosi. If there are no offsets as part of the deal, the increase in spending would result in could add roughly the same amount per year to the federal deficit as the recently passed Republican tax law, for which many GOP members voted.